Our family currently lives in Louisville, Kentucky! It is a beautiful 4 season state. 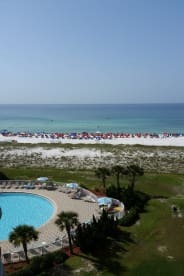 However, we have been vacationing for over 25 years to the white beaches of the Emerald Coast. We decided to invest in our favorite place, which is the BEST KEPT SECRET OF NAVARRE BEACHES. Please know that we come as often as we can and have opened our place to others to enjoy. Total pride and thought went into decorating this 1500 sqft condo. We want it to be as comfortable as if you lived here everyday. Fire code in our building allows up to max of 6 people in this 2 Bedroom condo. For over 6 people there are 3 BR units for rent in our community. We have 3 beds with pillowtop mattress, 2 full baths, fully stock kitchen, comfortable seating, great beach decor and colors, nice size dining, large balcony and a very well kept & clean condo. Best of all is the spectacular view from our living room couch and of course the spacious balcony we have. We hope our quest treat our place and respect it as if it were theirs as well. There is covered parking for our unit on the first level, tennis courts, exercise room, outdoor grills, our elevator takes you straight down to pool and walks right to the beach from the pool. So we invite and share our place for as reasonable price as possible. This is not an investment unit as some condos may be. This is our home at the beach! We hope you will love it and want to come back year after year. Please contact myself as often as you wish or need to. WELCOME TO THE BEACH!!!! !